1 Federal Census, MD, Anne Arundel County, 1940, Annapolis, E.D. 2-38, Sheet 17A, Image 33 of 42, Ancestry.com (Online Census Images). 2 New England Ancestors Magazine, 2008, Vol. 9.4, pp. 45-46, New England Historic Genealogical Society (Online Database). 3 Carnes, Mark C., ed., American National Biography: Supplement 2, New York: Oxford University Press, Inc. (2005), 375. 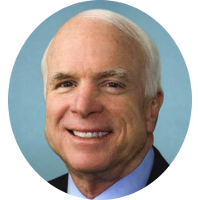 5 Wikipedia, "John McCain", (accessed 02/17/2016).